This month we invited guest blogger Annmarie Gatti to write about one of her favorite films - The Bridge On The River Kwai - for the getTV website. Annmarie runs the extremely popular Classic Movie Hub site and can be found all over social media @ClassicMovieHub as well. I’ve been a classic movie fan for as long as I can remember. Whether watching screwball comedies or romantic dramas with my mother, or learning all about The Marx Brothers, Charlie Chaplin, and W.C. Fields courtesy of my father, some of my fondest childhood memories revolve around enjoying these wonderful films. As time went on, it became second nature for me to watch these films over and over again. I sought out new classics to enjoy, but it was only on rare occasion when I would step out of my genre ‘comfort zone’ and purposely watch a war film. Directed by the now-legendary David Lean, The Bridge On The River Kwai is an epic WWII war film starring Alec Guinness, Sessue Hayakawa, and William Holden. The 1957 movie was adapted from the 1952 best-selling novel Le Pont de la Riviere Kwai by Pierre Boulle, which, although largely fictitious, was based on Boulle’s own war experiences. It also pulls historical context from the construction of the POW-built 1942-43 Burma-Siam railway. So what is it that draws me to this film? Yes, it’s the masterful direction of David Lean. Yes, it’s the dynamic performances of the stellar cast. Yes, it’s the beautiful cinematography. Yes, it’s the scale and scope of it all. And, yes, it’s even more. But what really sets this film apart for me is the tremendous battle of wills that plays out between Saito and Nicholson. Each man is bound by a strict moral code of honor and duty that compels him to win at all costs. If Saito fails to complete the bridge on time, he is bound to perform ritual suicide; Nicholson would rather risk death than yield to Saito’s commands which violate wartime law. And, although Saito and Nicholson are stubbornly and diametrically opposed, they are essentially operating under the same code of honor. As the conflict evolves, honor and duty are again taken to extremes as Nicholson becomes obsessed with building the bridge as a testament to British ingenuity - seemingly oblivious to the fact that he will now be aiding the enemy, a potentially treasonous act. It is this dynamic that makes me wonder… Is it honor and duty that eventually drive these men to ‘madness’? Or is it honor and duty that help these men stay sane under extreme and extraordinary circumstances? How could I not thoroughly enjoy a movie that can immerse me in questions like these? Hayakawa and Guinness are each magnificent in their roles. Although playing disciplined and unyielding officers, their performances are laced with nuances that allow us to understand and appreciate their characters’ mindsets, dilemmas, and subsequent choices, painting compelling portraits of honor and duty that are inherently and tragically flawed. Box office draw William Holden plays the cynical but pragmatic Shears whose storyline adds an action/adventure aspect to the film and, more importantly, provides the ultimate conflict that propels us to the spectacularly ‘mad’ finale of the film. 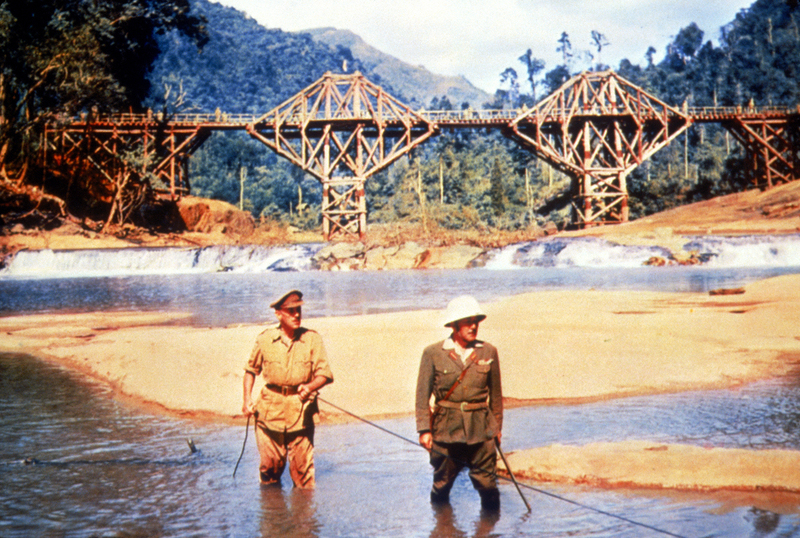 The Bridge On The River Kwai was the first of David Lean’s five epic films and the third of six movies that he made with Alec Guinness. It was released in the US on December 14, 1957, taking in a reported $17M+, which made it the highest-grossing film of 1957. It was nominated for eight Academy Awards, wining seven -- including Best Picture, Best Director, Best Actor (Alec Guinness), Best Cinematography, Best Film Editing, and Best Music, Scoring. It won Best Screenplay for author Pierre Boulle, although the actual screenwriters were Carl Foreman and Michael Wilson who unfortunately were blacklisted at the time; however, they were both awarded their Oscars posthumously in December 1984 and their screenwriting credits were restored by the WGA in 2000. Sessue Hayakawa received his only Academy Award nomination for this film (for Best Supporting Actor), but lost out to Red Buttons for Sayonara. In 1997, the film was inducted into the National Film Registry by the US Library of Congress. Join me as I watch The Bridge On The River Kwai on Sunday, August 21 at 6 pm ET, which is followed by the biography William Holden: An Untamed Spirit at 10 pm ET. You can also catch the film earlier in the month on Thursday, August 11 at 12:05 am ET and later in the month on Tuesday, August 30 at 8 pm ET.